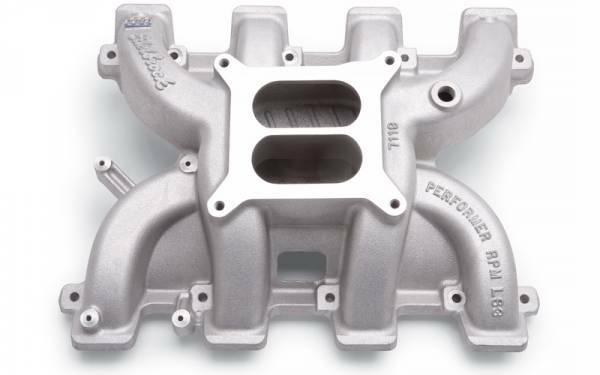 Designed for Gen IV engines with LS3, L92 and L76 rectangular port cylinder heads. The Performer RPM LS3 manifoldis ideal for anybody looking to build a carbureted LS3 or LS2 engine with an operating range between 1,500 - 6,500 rpm. It allows the use of a carburetor on these originally computer-controlled engines, offering maximum power and a broad torque curve. It features a high-rise dual-plane design combined with a plenum that has been optimized for square-bore carburetors. Our advanced casting techniques allowed us to create a lightweight casting that weighs in at 14 lbs. Performer RPM LS3 includes a provision for mounting an MSD Ignition Timing Control Module #6012, including passages for routing the coil wire harness, for a clean look. A special throttle and trans bracket that works with 700R-4, 200-4R and Turbo 350 transmissions is also included, making this an easy retro-fit into any muscle car, street rod or marine application. CARB RECOMMENDATIONS: Edelbrock Thunder Series AVS or Performer Series (600-800 cfm) Carburetor. Edelbrock Installation Note INSTALLATION NOTE: Uses LS3/ L92/L76 style individual port o-ring seals GM PN19256623. Manifold height: A-4.66", B-5.56"; Carb pad height: 5.11"; CA-3°. Carb height (CH) for this manifold is measured from the valley cover flange to the carb pad. Port exit dimensions: 1.16" x 2.40".